Titanium and titanium alloys can be joined by fusion welding processes including gas tungsten arc welding (GTAW), tungsten inert gas welding (TIG), gas metal arc welding (GMAW), plasma arc welding (PAW), electron beam welding (EBW), laser beam welding (LBW), friction welding (FRW), resistance welding (RW). 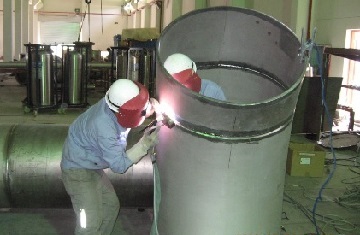 Among all of them, GTAW is the most widely used welding process. It can be done manually or automatically, with or without filler metal. Inert gas shall be utilized to shield the weld metal from the atmosphere to prevent contamination with oxygen, nitrogen, and carbon. The GMAW is less costly than GTAW especially when the base metal thickness is greater than 0.5 inch. The PAW provides a much faster welding solution by using square-cut and keyhole techniques. The EBM is very costly since it is performed in a high-vacuum atmosphere, which is mainly applied for aerospace and aircraft industry. The laser beam welding is similar to EBM except that only gas shielding is required. Friction welding of titanium is useful in joining tube, pipe, or rods, where joint cleanliness can be achieved without shielding. 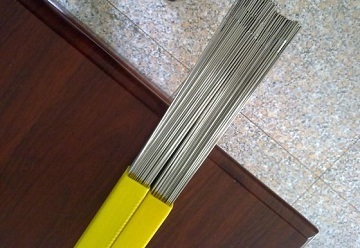 Resistance welding is primarily used to join titanium and titanium alloy sheet by either spot or continuous seam welds. It can also be used for dissimilar welding. The GTAW of titanium Gr.2 welded pipes. Titanium is a reactive metal and is sensitive to embrittlement by oxygen, nitrogen, and hydrogen, at elevated temperatures. Thus, the metal must be protected from atmospheric contamination. During arc welding, the titanium shall be thoroughly shielded from the ambient air until it has cooled below about 430°C [800°F]. The protective inert gas shall be furnished in accordance with AWS A5.32/A5.32M. Both the torch arc and base metal, as well as the backup area shall be shielded by inert gas. This can be achieved by using a chamber or a glove bag, which is purged of air and back filled with inert gas. The filler metals for titanium and titanium alloy welding can be either in the product form of wires, electrodes, or rods. Usually, they shall be free of fluxes which may combine with titanium to cause brittleness and reduce corrosion resistance. The filler metal shall be furnished in accordance with AWS A5.16/A5.16M (ISO 24034:2010 MOD) or ASME SFA-5.16 – specification for titanium and titanium-alloy welding electrodes and rods. The AWS A5.16 ERTi-2 welding wires. According to AWS A5.16, there are many classifications available: ERTi-1, ERTi-2, ERTi-3, ERTi-4, ERTi-11, ERTi-17, ERTi-27, ERTi-7, ERTi-16, ERTi-26, ERTi-12, ERTi-15A, ERTi-13, ERTi-14, ERTi-33, ERTi-34, ERTi-30, ERTi-31, ERTi-38, ERTi-32, ERTi-9, ERTi-28, ERTi-18, ERTi-5, ERTi-23, ERTi-25, ERTi-29, ERTi-24, ERTi-21, ERTi-36, ERTi-19, ERTi-20. The titanium base metal, as well as the titanium welding rods/wires, shall be free of thick oxide and chemically clean prior to welding, as contamination from oxide, water, grease, or dirt will cause embrittlement. According to ASME BPVC Section IX, the P-Numbers for titanium and titanium-alloy base metal cover 51 through 53, while the F-Numbers for titanium and titanium-alloy electrodes and rods cover 51 through 56. Stress-relieving is a typical PWHT for titanium and titanium alloys. Most titanium weldments are stress relieved after welding to prevent weld cracking and susceptibility to stress-corrosion cracking in service. Stress relieving also improves fatigue strength. Special care shall be taken to prevent grain growth and avoid the reduction of fracture toughness, creep strength, or other important properties. The stress-relieving temperatures and holding times shall be determined by specific material grades.